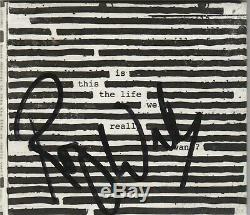 Signed copy of IS THIS THE LIFE WE REALLY WANT by Roger Waters (ex-Pink Floyd). I had this signed right before the New Orleans show in 2017, on the US + THEM tour. Parting with it because needs must. The item "Roger Waters Signed CD Is This The Life We Really Want Pink Floyd" is in sale since Saturday, March 23, 2019. This item is in the category "Entertainment Memorabilia\Autographs-Original\Music\Rock & Pop\Records". The seller is "okcseller-6" and is located in Oklahoma City, Oklahoma. This item can be shipped worldwide.